09:00 1% This is the start point and the light turns on at 1%. 12:00 100% From 09:00 to 12:00 the intensity will ramp up from 1% to 100%. 18:00 100% The light remains on and at 100% from 12:00 to 18:00 (4 hours). 21:00 0% At this time channel one shuts off until 09:00 the following day. Channel 2 is the same as channel 1 but I allow the blue to be on for 1 more hour for a nice visual effect in the evening. 22:00 0% —> This is the only change, one hour added to blue. 12:00 70% —> With time increase to 100% if corals appear to be doing well. 18:00 70% —> With time increase to 100% if corals appear to be doing well. 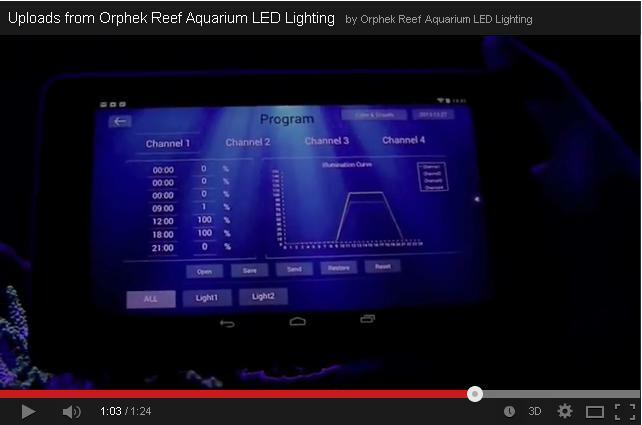 Channel 4 provides lighting to promote extra chlorophyll A and extra pink color to your corals. 12:00 80% —> With time increase to 100% if corals appear to be doing well. 18:00 80% —> With time increase to 100% if corals appear to be doing well. 21:30 0% —>Provides a nice color after white LEDs go off. ** Never end a program with 00:00 or Later because after 00:00 it is next day. You can choose Color & Growth program and after setting all 4 channels click “Send ” and then “Save ” and give your program a name like “my program”. If you want to change the program later, just choose “Open” , select my program, make your changes and send to the light.